I think a lot of people just don’t realize that there are other ways to tackle a problem. It’s possible to look at properties of the problem space — like bottlenecks or chunks — before proposing solutions [LW · GW]. These are (some of) the pieces from which understanding is built, and when they work, they allow much more efficient and elegant approaches to problems. This post was really easy to get into, was fluently written and generally was engaging to read. It actually taught me a potential new mental motion, or at least heavily clarified one, in the way it illustrated how bottlenecks in mazes influence the optimal strategy. I've done an undergraduate in CS, and so done lots of path-searching problems, and was familiar with the basic concept, but this connected my abstract idea of identifying bottlenecks with my intuitive planning sense. Great use of pictures and visual media. I have a guess that we are lacking that on LessWrong, and that a lot of our posts could be made a lot better with more diagrams. And for that I also liked how the diagrams were kinda janky photos of pieces of papers with crayon on them, because it set an example of how you can add diagrams to a post without needing to put in a ton of time and effort in illustrator or something. I think I would have loved a bit more generalization of the concept of mazes. There is the difficult question of what problems are actually shaped like the maze problem analyzed in this post, and I think the biggest thing preventing me from using the ideas in this post, is a lot of uncertainty about when it is actually a good idea to apply them. This is good as a stand-alone post, and I think it's valuable to have stand-alone posts, but I am also always in favor of linking to existing discussion of a concept, that we've had on LessWrong. In this case links to the section of the sequences were Eliezer talks about a bunch of graph-search algorithms, and some of the existing writing on chunking would have been great, but I understand that finding those posts can be quite a bit of a pain. Overall, very happy about this post. It won't literally do "at least as well as the original heuristic", I'm pretty sure. You could construct a maze where going in the direction of the bottleneck leads you into a longer path than going into the direction of the end. It'll of course do better in expectation. Yeah, on reflection that's right, I didn't think it through properly. I like the post. People naturally stick with one of the first few solutions that make sense to them (us), without investing a little more time into investigating the general properties of the problem space. We software designers are very prone to this. A couple more general patterns: working with the duals, working backwards. Could you give a few examples of what you mean by working with the duals, both in the maze context and otherwise? It brings at least one good maze strategy to mind for me, but the word is used in multiple ways, so I'm curious whether we're thinking of similar things. Do you perchance know anything about higher-dimensional mazes or labyrinths? As actual games, rather than metaphors for higher-dimensional problem solving. I do not, but I have always suspected there must be a community of such people somewhere. No idea. Just off the top of my head, the exponential growth in volume would be an issue for mazes in higher dimensions. Four would probably still be workable, though. Excellent post! Your explanations were interesting and intuitive for me, even though I don't know much of anything about computer science. Thanks! Glad it made sense, I wasn't sure it would. A neat example of the failings of heuristics when applied to mazes is the hedge maze at Egeskov Castle, Denmark (aerial photo, 2D diagram). It's constructed such that if you choose paths seemingly pointing towards the goal, you'll get caught in an infinite loop - and in fact, the most effective route can be found through a heuristic of choosing the path seemingly pointing away from the goal. 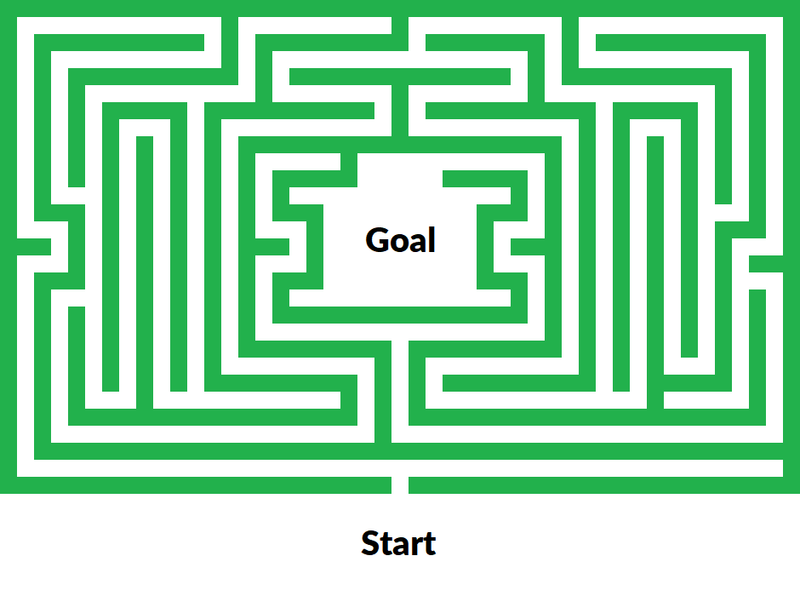 I really like the maze analogy! The pictures help a whole bunch in explaining the concepts! Related: I don't know if this has a direct analog to a CS algorithm, but one other heuristic which seemed like it might have been good to try was drawing a line from both start and finish incrementally to see how they could touch in the middle. This is really interesting and easy to understand, except I feel like I'm still missing a sense of how to actually apply this to the real world. I think this would really benefit from some examples of how one might apply each strategy to specific real-world problems. What comes to my mind is a kind of algorithm for auto-chunking: repeatedly take a dead end and fill it in until the point where it branches off from a hallway or intersection. Eventually you're left with a single hallway from entrance to exit. I'm not certain how it's an improvement over DFS, though. Answering my own musing: it's implementable as a 2-state cellular automaton, rather than requiring the ~5 states that distributed DFS does. So there's that. I really like this post, it's very informative about the kind of search algorithms that exist. I had one question though, in my experience as a child solving mazes with a crayon I stumbled upon the tactic of starting at the end and getting to the beginning. This worked really well for me, but it always confused me as to why it was easier. Does anyone have a hypothesis as to why this might be?